As shelter numbers have broken record after record, Mayor Bill de Blasio has been chided by rival politicians and jeered by tabloid editorial boards for his handling of the city’s homeless crisis. Quietly, however, the de Blasio administration placed seven times as many families in stable housing during its first two-and-a-half years as the Bloomberg administration did during its final four. That’s according to a policy brief by the Coalition for the Homeless released on Thursday. While generally favorable to the mayor, the study contains little good news for the city. “[E]ven though more people are exiting the family shelter system to stable housing than at any time since 2004, a significantly greater number are falling victim to the severe dearth of affordable housing, rising unemployment, and domestic violence – and have been left with nowhere to turn but homeless shelters,” it reads. 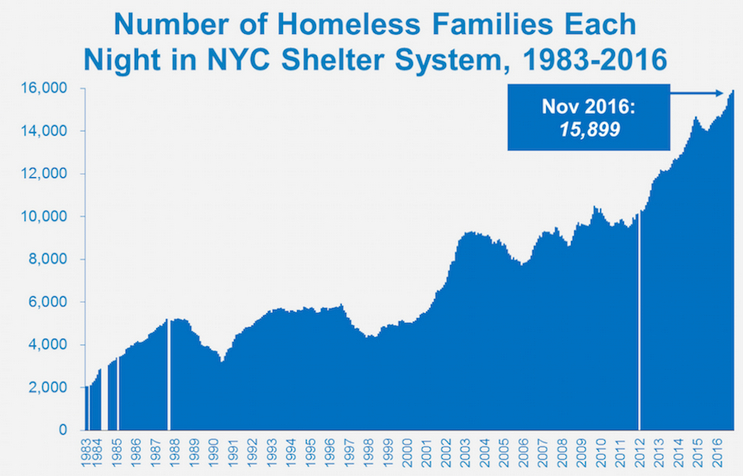 De Blasio’s LINC housing voucher programs and his decision to re-open public housing and Section 8 priority lists to shelter residents is credited with increasing the number of people from shelters to stable housing–and staying there, leading to a decrease of 15 percent over the past three years in the number of formerly homeless families returning to the shelter system. The leading culprit is the usual suspect: a lack of affordable housing. While domestic violence remains that top cause cited by new shelter entrants (30 percent of the 5,600 families who entered the system in the first 11 months of fiscal year 2016 cited domestic violence as their reason for seeking help), eviction and overcrowding comprised 42 percent of cases. The report notes, however, that while the number of families citing overcrowding has grown, the share blaming eviction has decreased–a change the Coalition credits to the de Blasio administration’s funding lawyers to defend some tenants in housing court. Economic weakness is also part of the story. While New York City’s job market has been fairly robust, the report found “a sudden reduction in the number of employed New Yorkers of 129,000 between March 2016 and August of 2016, and a related impact on unemployment: There were 35,198 more people receiving unemployment benefits in October 2016 than in June 2016.” That leap is likely reflected in the shelter numbers. A sudden tightening of eligibility rules in November could reduce those rates, however. And that’s not the only note of discord with de Blasio in the report. It argues that the mayor has not gone far enough: While his administration has reconnected the shelters to NYCHA and Section 8, and said that the mayor’s affordable housing plan would include units for the formerly homeless, the number of apartments and vouchers set aside is far lower than advocates want. Among the report’s recommendations is increasing those numbers. I’ve been on nycha waiting list almost ten years. I also been in the shelter twice while being on he waiting list, and currently in one. I was told by Wagner projects assistant manager that there are plenty of vacant apartments. Can I please get some help in getting permanent housing and to stay out the shelter with my two children and spouse who works.